Size of Male: 9-15 lbs., 10 in. Size of Female: 9-15 lbs., 10 in. The Tibetan Spaniel is believed to be a very ancient breed. They are one of several breeds native to Tibet, along with the Lhasa Apso and the Tibetan Terrier. “Tibbies” make excellent pets. They are happy, self-confident and very intelligent little dogs. They love to be with people and they are great with children. They do have an independent nature at times and they will bark to warn of a stranger approaching. The Tibetan Spaniel is a very old breed. There are believed to share their early beginnings with the Pekingese, the Japanese Chin and some other small dogs from southeast Asia. The Tibbie is native to Tibet. They were kept by Buddhist monks in the monasteries and made good little watchdogs, alerting the monks to any intruders. These little dogs were also given as gifts to royalty and appeared in China. Tibbies were also valued by ordinary Tibetan people as good watchdogs. The dogs were being bred in the UK by the 1890s but are not known to have been bred in the United States until 1965. The Tibbie is a happy and assertive dog. They are very intelligent and dog training is usually easy, but they can be aloof with strangers. Tibbies have been competing successfully in obedience and agility which shows they are trainable and enjoy doing things with their owners. These little dogs make very good family dogs. They love being with people and they are especially good with children. They also get along well with other pets. They make very good watchdogs since they are alert and notice everything that goes on. However, they don’t tend to bark much unless there is really something to bark at. Living Environment – These dogs have lived in close proximity to humans for several thousand years. They need to be close to people in order to be happy. This means living in your house or apartment, with all the privileges that go with it. They do very well as apartment dogs. Grooming – Tibbies don’t have very difficult grooming needs. They have a medium length double coat that needs to be brushed regularly. They are an average shedder. Diet & Exercise – The Tibbie has normal dietary needs for a small dog. They do need moderate daily exercise. They are more active than some small dogs and can move very quickly. However, they are usually quite calm indoors. Do provide your dog with a good walk every day. Health – This dog breed can be prone to progressive retinal atrophy, liver shunt (portosystemic shunt), dog allergies, cherry eye, and some other dog eye problems. If you’re interested in this breed you should talk to a breeder about possible dog health problems in the breed. 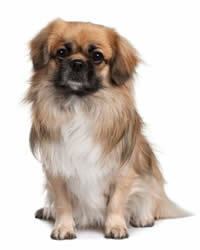 The Tibetan Spaniel is a very intelligent dog and dog training is usually easy. They can be independent, willful and even stubborn at times so you may have to be creative with your training. However, Tibbies often do well in obedience and agility so they can be trained if you are persistent and find ways to keep them interested. Use positive dog training techniques (praise, treats) and you should be able to train your Tibetan Spaniel. Tibetan Spaniel - All I Ever Asked For!